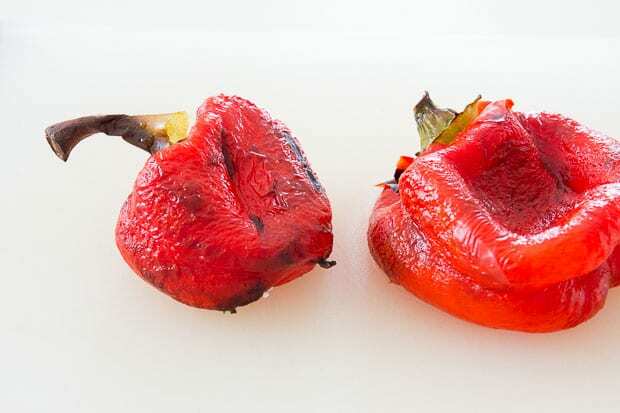 Roasting red peppers not only makes them easy to peel, it makes them incredibly sweet and flavorful. My technique for making perfect roast peppers. Bell peppers are a fantastic way of adding flavor, sweetness and color to dish, but the simple act of roasting them amplifies their sweetness, umami and flavor elevating them from simply delicious to utterly magical. That’s because the Maillard reaction turns the reducing sugars and amino acids present in the peppers into entirely new flavor compounds. Along with caramelized onions and dashi, roasted red bell peppers are an essential part of my flavor arsenal that I always try and have on hand. When pureed, roasted red peppers are a fantastic way to add a boost of flavor to sauces, dressings, soups and stews, but they can also be sliced and added directly to salads, breads and stir-fries for color. 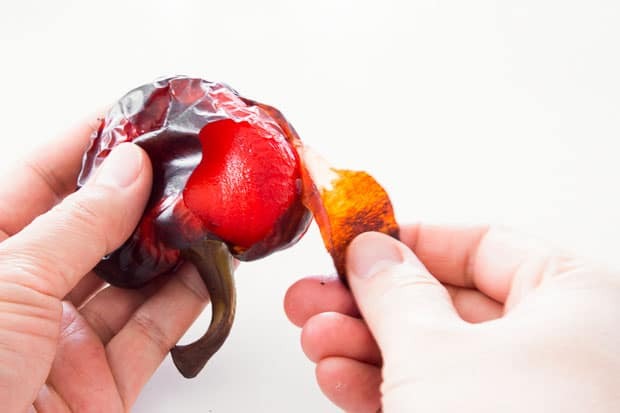 While it may not be practical to spend forty five minutes roasting and peeling peppers every time you want to use them, once they’re properly roasted, you can store them in olive oil in the fridge for up to two weeks. You can also puree them with olive oil and freeze them in ice cube trays, which make for instant cubes of flavor that will last for months. If you’re anything like me, you may be tempted to speed the roasting process up by using a higher temperature, or even a torch, but don’t do it. They won’t peel as easily and you’re going to miss out on all the caramelization and Maillard goodness that happens as the pepper slowly roasts. Also, peppers that have been roasted quickly tend to have a much higher water content, which will make them spoil faster. I’ve used red bell peppers here, but you could do this with orange, yellow, or even green bell peppers. 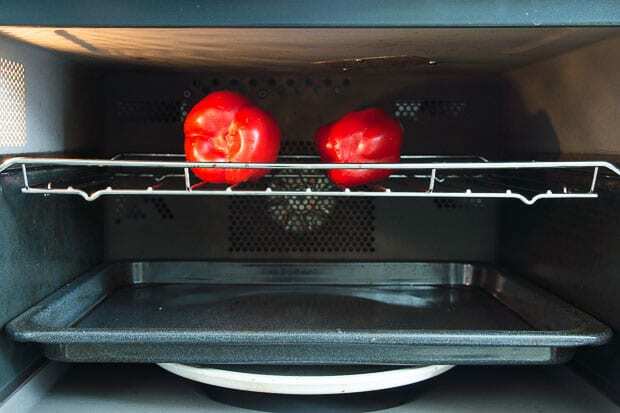 Put the pepper directly on the oven rack in the middle of your oven and stick a sheet pan on the rack below to catch any juices that come out of the pepper. 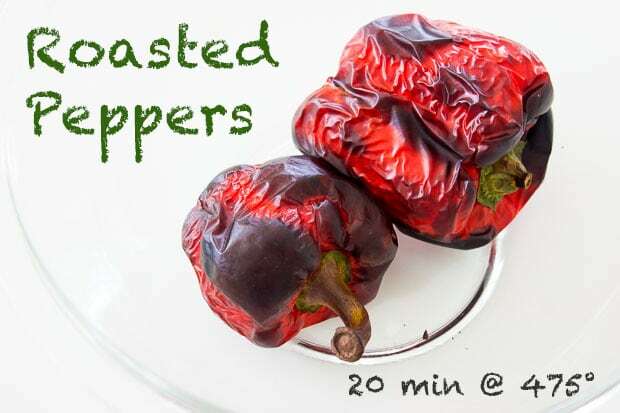 Turn the oven on to 475 degrees F (250 C) and roast the peppers until the pepper is charred across 75% of it's surface, about 20-30 minutes. Place the pepper in a bowl and cover with a lid. The steam helps separate the skin from the pepper making it very easy to peel. Once the pepper is cool enough to handle, peel off the skin. You should then be able to tear segments off of the stem, removing the light colored membranes any seeds as you go. 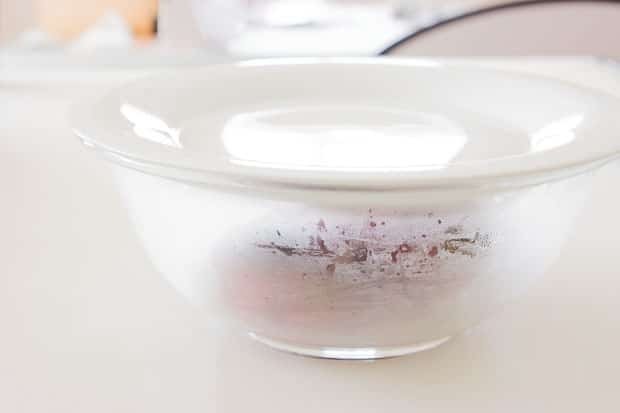 Use the roasted peppers immediately, or put them in a container and cover them with olive oil to store them in the refrigerator for up to 2 weeks.